Winter is the season for a King Mackerel fishing charter in the central Gulf waters of Tampa, Florida. This migratory fish heads to the southern Gulf when water temperatures drop, and Florida sport fishers break out their lines and hooks. This fish is the largest of the Scombridae family. Description: The King Mackerel has a menacing appearance. Its long, narrow body is a common shape for predatory fish. Unlike the Spanish Mackerel, the King Mackerel lacks a distinct black spot on its dorsal fin. Its body is an iridescent silvery-green, and as it ages the olive-colored spots on its body fade. Size: The King Mackerel is a small to medium-sized game fish. It commonly weighs in between 15 lbs and 50 lbs, though fish over 6 ft. long and 100 lbs. have been recorded. This fish carries consumption advisories in the Gulf, as it consistently tests high for mercury. The strong taste of its flesh discourages many people from eating it, though it is edible. Location: Winter is the most common season for King Mackerel in the central Gulf of Mexico. This species prefers open water, and it is found as near to shore as clear water can be found. It is almost never found inshore. Commonly, King Mackerel swim in small groups and feed aggressively. King Mackerel fishing charters offer a perfect break to a monotonous winter season. 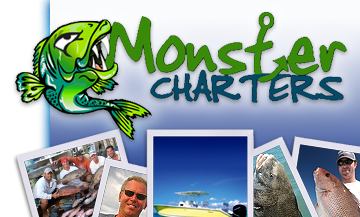 Hooking a King Mackerel is certain to make you feel like a king, and Monster Charters is happy to help. Contact us today to reserve your exciting, winter fishing charter.